This is the simplest bean salsa you will ever make! Serve with pita chips, veggies, sweet potato chips...throw it on top of a salad...whatever you want! OR just get a spoon and dive in! Mix gently and season with salt and pepper. ENJOY!! These are pretty tasty and very easy to make. Kind of like my protein bite recipe but changed up the flavors a bit. Try it out and let me know what you think! 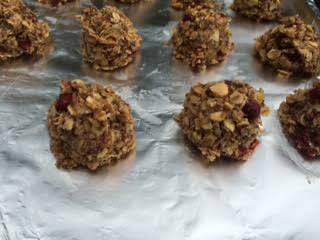 Bake oats, almonds and coconut in 350 degree oven for 10 min, mixing after 5 min. Then cool. Microwave the nut butter for about 20 seconds, or until a little runny. Mix all ingredients together once the mixture from the oven is cooled down. 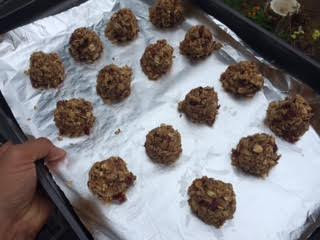 Form into bite size (I used a cookie scoop) and place on baking sheet. Makes 16-20. 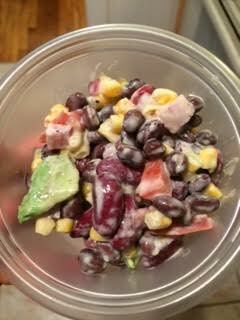 Put in freezer for 30 min then store in container in fridge or you can freeze them! Not a 21 day fix recipe but I would guess 2 bites counting as 1 yellow, 1 tsp and maybe 1/2 blue! Use a spirulizer to make zoodles out of 4 zucchini. Then saute them on the stove and add ground pepper (no oil) just a little pam if the pan needs it. I did it in 4 batches because I wanted to get some nice color on the "pasta"
Then for the sauce...which if you like fettuccine alfredo, this is right up your alley! 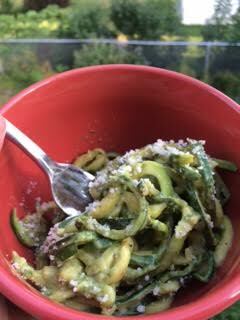 In a food processor blend together 1 medium ripe avocado, pepper and salt to taste, 1/4 cup fresh basil, 2 garlic cloves, 2 tbsp fresh lemon juice, 2 tbsp extra virgin olive oil. Blend until smooth. Mix it all together and serve! 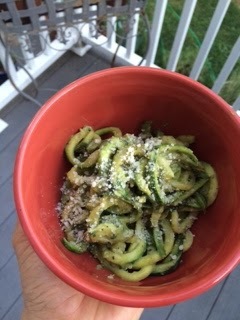 You can sprinkle just a little Parmesan cheese on top if you want (like a teaspoon). Makes 4 servings. 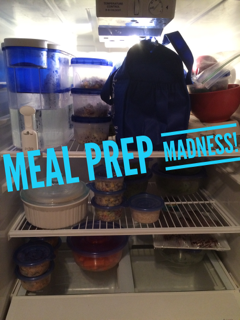 21 Day fix: 1 green, 1 blue. It has been a while since being home and meal prepping. WOW have we not missed doing dishes! A dishwasher is definitely on the MUST HAVE list when we start house hunting. Very excited to be home after tons of traveling and have a fully stocked fridge. New recipes on the menu including a homemade black bean burger, creamy avocado zoodles, and a bean salsa to top our salads with. All 21 day fix approved! Workouts will include a combination of body beast/ insanity max 30/ and some outdoor running! We will have to find a place for an additional protein in our meal plan, which will most likely be another shake each day. Have a great week everyone! And as always whenever you have meal plan questions or questions on workouts, shoot me an email at LynnG258@gmail.com.